Manchester's James are returning after a six-year absence is well-timed. 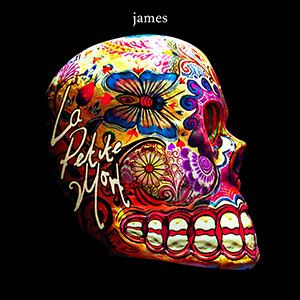 Not that there is any indication that Le Petite Mort arrives on the back of some notion of jumping on a bandwagon; James (and particularly lead-man Tim Booth) have always been a band to do things their way. Formed in 1982, James are still best remembered for the anthem Sit Down (a number 2 hit in the UK in 1991). They enjoyed their biggest success at the start of the nineties but were always more cerebral than the laddish dance-rock of the likes of The Stone Roses and Happy Mondays. A number of underrated and impressive albums have followed over the years and this is one of the best. The album was recorded in the wake of Booth losing his mother and best friend in a short space of time (they are mentioned on the sleeve notes) and therefore you would expect a darker, funereal feel. But Le Petit Mort (The Little Death) chimes with optimism and hope. Lead single Moving On has the heart wrenching plea, 'didn't see it coming, never said I loved you, hope you knew', yet the song has an uplifting feel, with a wonderful brass refrain underpinning the chorus. There are more references to mortality on the epic opener Walk Like You ('let's inspire, let's inflame, let's create from our pain') but Gone Baby Gone, which you expect to deal with death, is a stark reflection on the end of a relationship and sounds like U2 during their Zooropa phase. There are more vulnerable moments, like the delicate Bitter Virtue, while the piano washes of Quicken The Dead are sublime. Album closer All I'm Saying begins with raindrop like keyboards before breaking out into a typically catchy chorus, before Booth closes the album with the words 'I'm missing you and all the worlds you opened up to view, I love you, see you next time'. It's a heartbreaking goodbye to someone lost. With James on this good a form you hope it isn't the band's final goodbye.